*This recipe was made with cashews from my partnership with NOW Foods. We are mixing it up here in the nut butter realm this week. Normally, homemade almond butter is my jam, but after receiving a bunch of cashews from NOW Foods this month, I decided to switch it up. Don’t worry, I still have almond butter ready to go as well. Decisions, decisions. When I used to make cashew butter, it was with the bulk cashews I got from Costco. These weren’t raw or roasted, but instead prepared in some way with peanut oil that made the butter taste like potato chips or something. Some people loved it, but it wasn’t really my thing. Because of that, I hadn’t made it in a long time. Once these lovely, raw cashews ended up at my door, however, I knew the time had come again. I always love roasting the nuts before I made them into butter because I feel like it gives it a richer taste, but you’re welcome to leave them raw as well. Cashews are delicious no matter how you have them. As you can tell, I’m a big fan of the overhead shot. I like the way it looks, but more importantly, I am terrible at taking anything different. If I actually used a real camera, that might change, but for now you can bask in all the glory of these birds-eye-views. ANYWAY, I had some time before teaching last week and had the genius idea to whip some up. From idea to conceptualization, this process only took about 25 min (bc of the 10 for roasting). Cashew butter is way faster than almond, so if you don’t have the patience for the latter, start with this. I forgot how amazingly creamy cashew butter is and now I think I may need to stock up on some more. I also need to get back into the habit of making cashew milk at home which is also MUCH faster than almond milk and you don’t even have to strain it. Ok, enough about the magic of cashews. Make this. Stat. Preheat oven to 350 degrees. Spread cashews onto a parchment lined baking sheet and roast for 8-10 min. Add to food processor (can still be hot), turn on, and add dry spices (everything except maple syrup). You may need to stop and scrape down sides as it processes. Once the cashews break down to a smooth butter (approx. 10 min. ), stop and add the maple syrup. The butter will start to clump up, but leave processor running and it will soon break down again. Run processor until cashew butter reaches desired consistency. 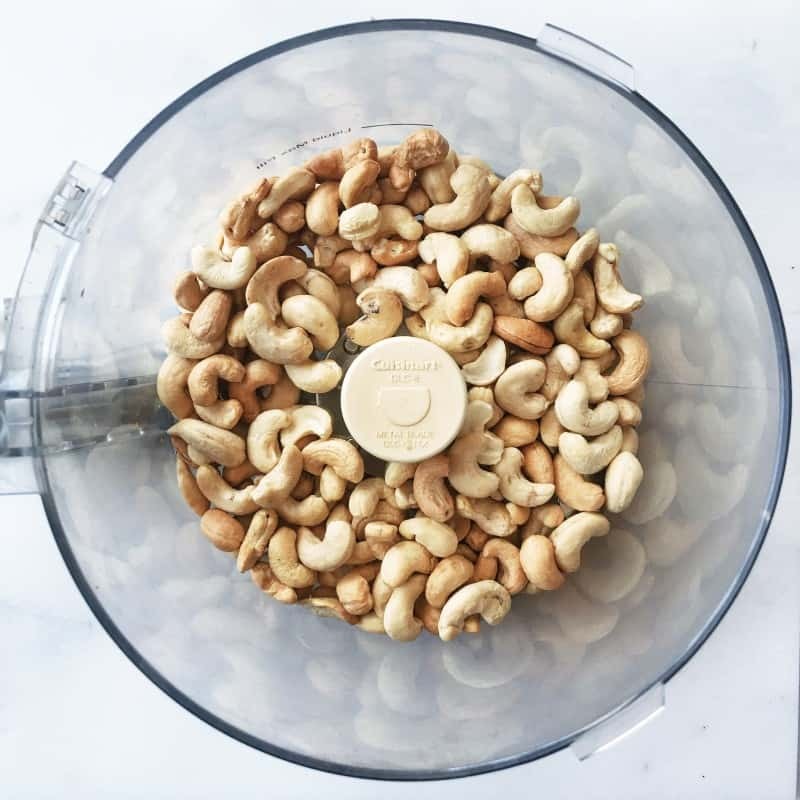 *I’ve tried making both almond and cashew butter in my Vitamix and I definitely prefer a food processor over the blender. It’s quicker to clean, easier to get the butter out, and (for me), I found that the only way I could get the nuts to break down in the Vitamix was to add oil. The whole point of me making them at home was not to have the added oil, so I always stick to my processor now. If you have had blender success, let me know in the comments! 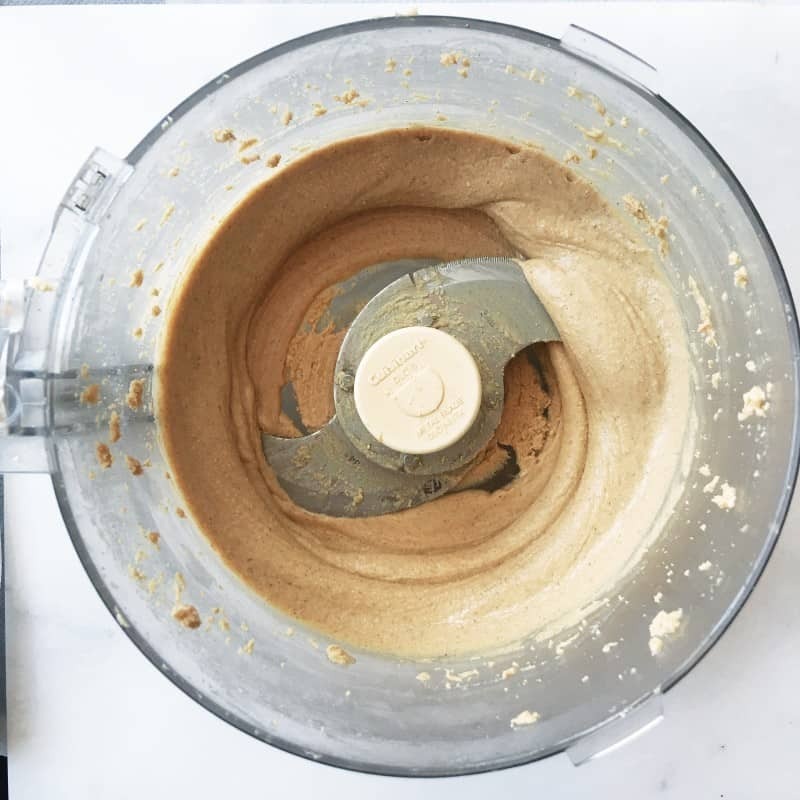 A quick and delicious maple spiced cashew butter recipe. 15 min! What’s your favorite type of nut butter? Sign me up for any but butter! You know I still haven’t made my own? This winter I plan to get on it for a few dessert recipes I have in mind. Oh girl you need to get on that. It’s so much better than store bought!! I’ve been loving cashew butter lately. And maple is my fave. I need to get a food processor so I can make this. I have a Blendtec but for as good as everyone says it is, I can’t seem to make things like this in it. I am obsessed with cashew butter! It is definitely my favorite type. I usually stick to almond milk, but sometimes switch it up for cashew milk- it’s so good in smoothies! It’s so creamy and delicious!! Maple + cashews sound like a delicious combination! And I'm a huge fan of cinnamon – sweet and slighly spicy – YUM! Jennifer @ fitnana.com recently posted…BEAT THE HEAT WITH FLAVOR-INFUSED WATER! Obsessed with cashew and coconut butter right now! Those spices you mixed in sound fantastic! I’m loving cashew milk now too. I had the best homemade cashew milk at a local brunch place this past weekend. I like cashew milk better than almond milk. It’s so creamy and delicious!! Woah this looks killer! I love specific non-dairy milks for certain things. Ice cream Id go for cashew milk hands down. With cereal? Give me almond! Smoothies? Give me coconut! Favorite nut butter is still peanut butter…i cant stop! Man you have this down to a science! THIS. I just tried this with walnuts, and Erin… Wow, like you said store bought really has no comparison. This is AMAZING. I was non stop licking out the food processor. OMG right?? I haven’t had store bought in years!! Just whipped it up? You are quite talented hhehehe. Sounds yummy! Cashew butter is my favorite! 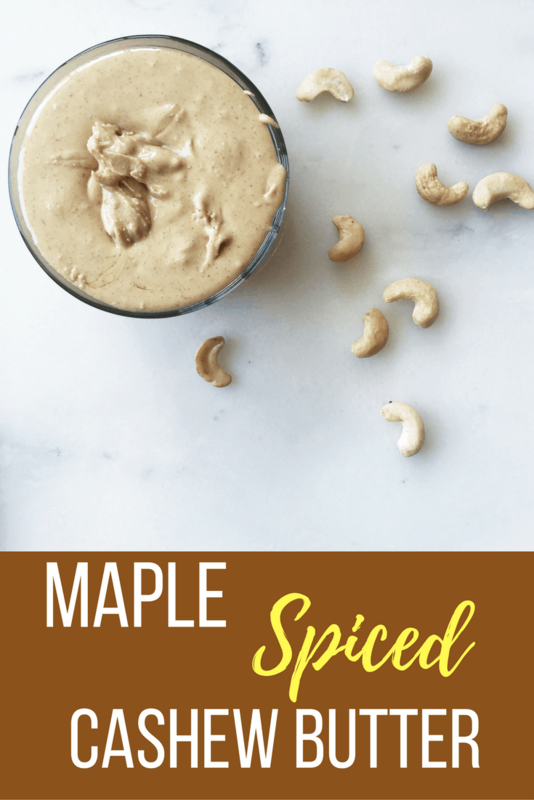 Maple spiced and homemade…even better – I need to make this! Dooooo it. It’s so quick! Oh, you KNOW I am straight BASKING in these bird’s eye view shots. YUM. I think I still have cashews in my pantry. When I get back from being out of town, I’m for suuuure going to make this. Hold me accountable, puhlease. Ok I will. 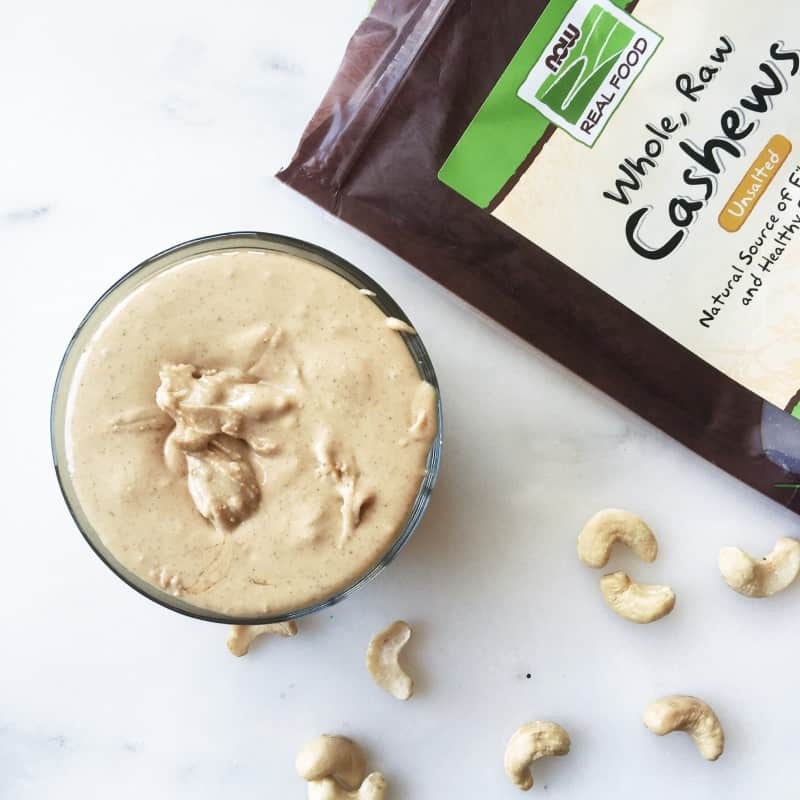 There’s no excuse for not making at least cashew butter – it’s so fast! This looks ahhh mazing! I can not wait to replace my food processor and try this! I’ll have to hide it from my husband! haha. kinda not sorry! Denise recently posted…MIMM-Plans Change or They Never Were?